Today’s my birthday, and it’s been so nice. Started off with birthday greetings over the phone from my parents, then waffles for breakfast with Jay and our friend Can (pronounced “Jon”) whom we met four years ago on the Saint James’ Way; he’s been visiting us these past few days. It’s been a week of catching up, reminiscing, late-night discussions, and the watching of BBC documentaries, Monty Python sketches (I’d never really seen them so the guys caught me up to speed a bit), and 80’s commercials on YouTube (gotta love John Denver). The three of us at a pilgrim hostel back in 2006, somewhere in Spain. We randomly kept meeting Can throughout France and Spain—I mean we had completely absurd coincidences of running into him throughout two and a half months and a thousand miles…and the guys have kept in touch over the years. 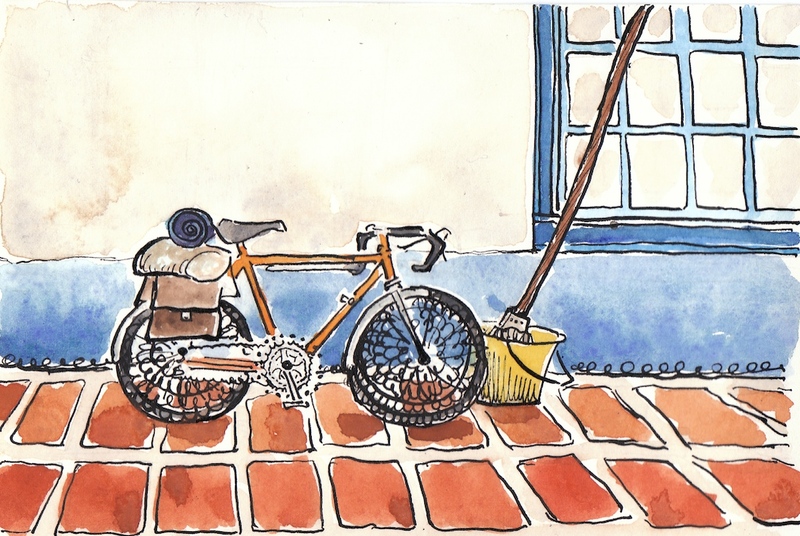 I did a sketch each day (except for one) during our 73-day hike; this was one I did of Can’s semi-trusty bicycle, Bazou. And finished off the day with yummy home-made cake with friends. Sigh of contentment. The piece I’m showing today for Weekly Art Wednesday is one that I finished up a few days ago, an illustration from the book of Psalms. I was planning on mailing it to our church in the States to participate in an evening of artistic expression of the Psalms, but unfortunately I didn’t finish it quickly enough to arrive on time, unless I wanted to spend over $100 to expedite it. That was just a little too steep for me. 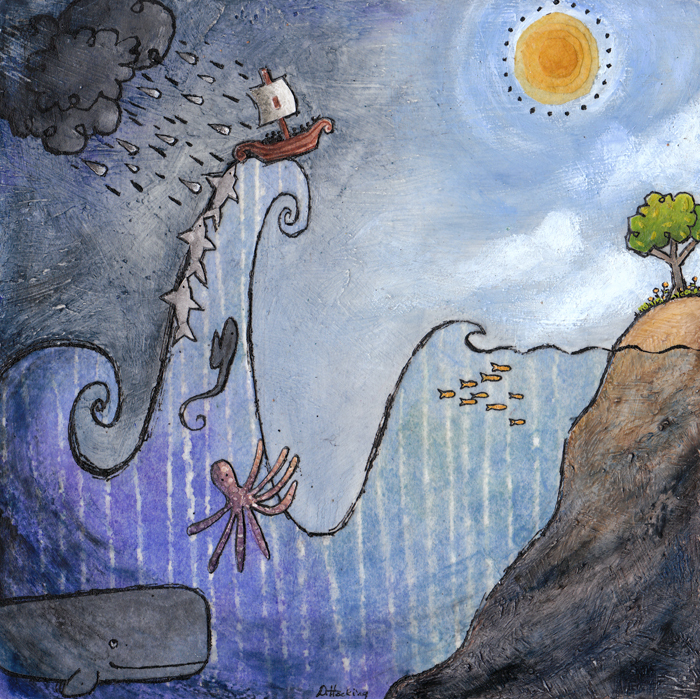 I chose this passage because I liked the imagery and the story — I thought it would be enjoyable to make into a picture. And also because the idea of God directing us through overwhelming or difficult circumstances into a haven of peace is an idea that’s kind of been resonating with me throughout the past year or so. I did these on 7″ by7″ wood panels, and used modeling paste, collage, acrylics, ink, and wax medium. shop here. 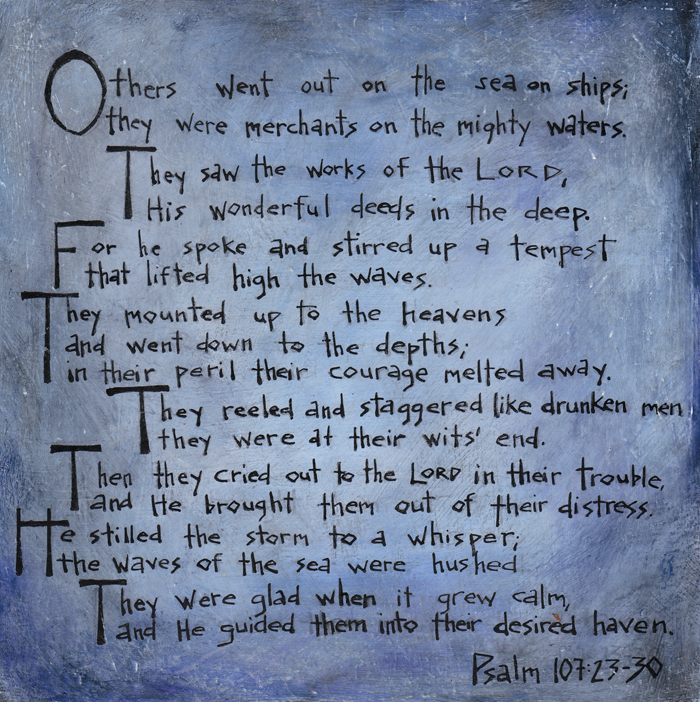 Debbie…thanks again for participating in the Psalms Cafe with this piece. I hope you don't mind that I printed off a copy to take home and show Brandi!